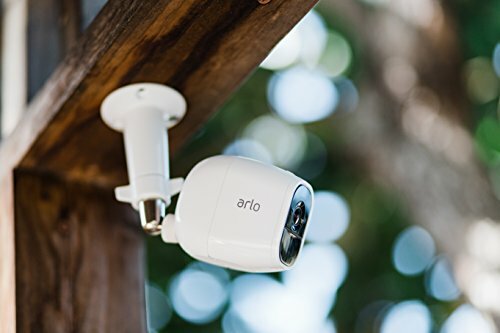 Best Bump Proof Locks Reviews: Top 10 in April 2019! A bump proof lock is a necessity for any security minded homeowner. “Bumping” is a term that locksmiths use to describe the process that picks locks using a special key “bumps” that lockpickers and smiths use to open a lock when there is no key. The special bumping key is inserted into the lock and is tapped with a screwdriver or other device; this forces the pins in the lock to jump to the shear line. Once the pins have lined up, the key is turned, and the lock is opened. The internet provides “lock bumping” kits online for locksmiths and anyone that wants to open locked doors without a key. Anti-bumping devices are locks that have an internal design that prevents bumping. They have more pins and specially made keys, with shallow pin stacks to prevent them ‘jumping’ up, and some locks feature programmable sidebars and no top pins. 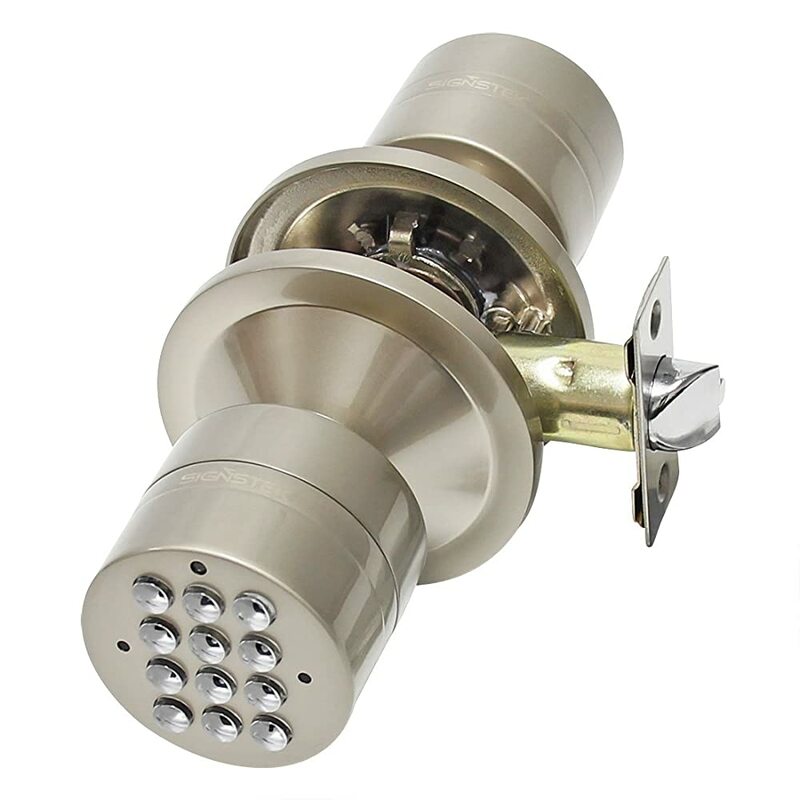 Another option is to use a rotating disk lock that is bump proof, as well as using keyless locks that open with coded mechanical, electromechanical and digital means. The Schlage Touch is a keyless lock that has a battery operated coded locking mechanism. This model removes the need for a key, and you can create up to 19 optional codes for individual access. The buttons are designed for “rough” application, for instance, wearing gloves in the rain, and the slim design fits perfectly on any door, providing you with a sleek yet smart interface for any door. This lock comes with LED down lighting that illuminates the code numbers and comes with dedicated icons for both battery life and programming mode. The unit’s 9V battery lasts for 2 years. This is a commercially certified Grade 2 lock, and since there is no keyhole, it is 100% bump-proof. The Lockey M210 is a Keyless Mechanical Digital Deadbolt Door Lock, so it’s definitely picked and bump proof since there is no keyhole to insert a key or device into. This model has an antique brass look, but there are many different finishes to choose from. 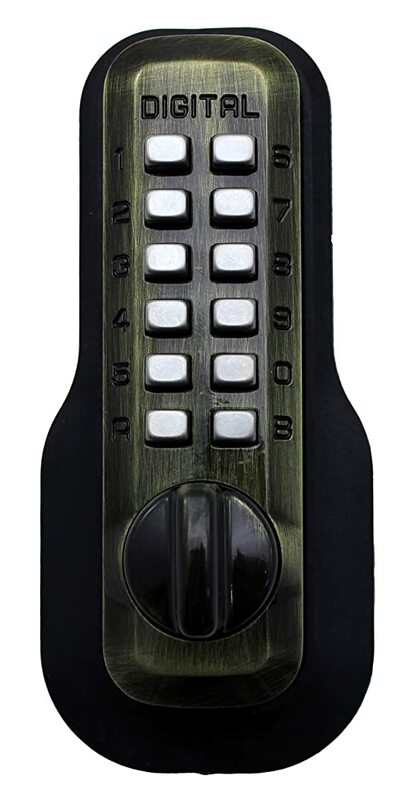 The Lockey M210 has a 12-button mechanical lock that is easy to code and is made of zinc plated steel exterior with Teflon coated internal steel components. This is a perfect solution for any application and can be used for external or internal doors, where a keyless security option is preferred. 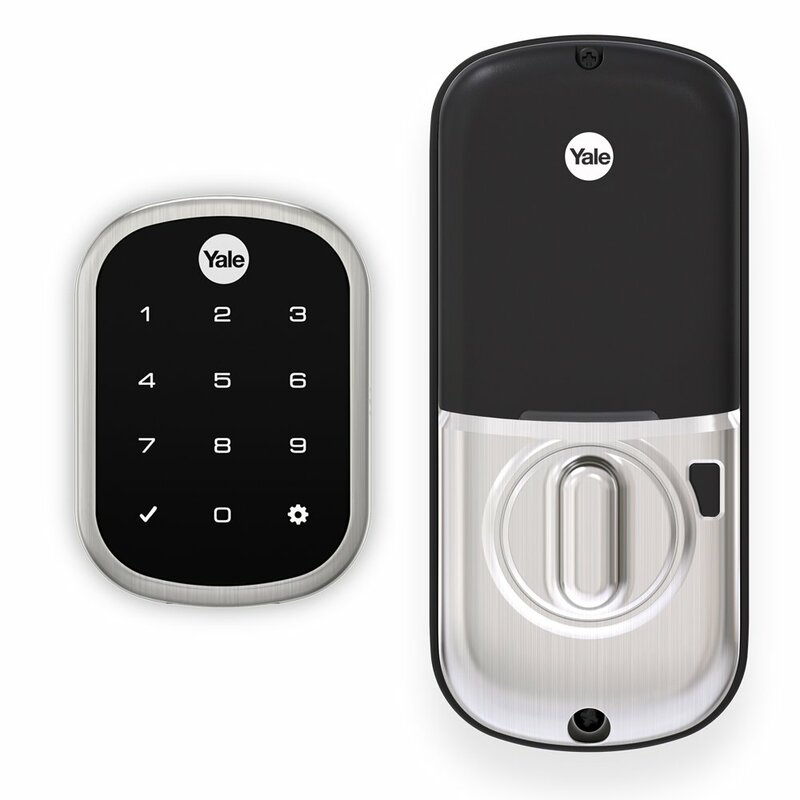 Yale is a world leading brand in lock security, with over 150 years of experience in locks, its products are among the best on the market. This model, the Assure Lock SL is a keyless coded Grade 2 lock, that comes with a slim touchscreen. The Assure is an exemplary example of how Yale continues to advance with technology. 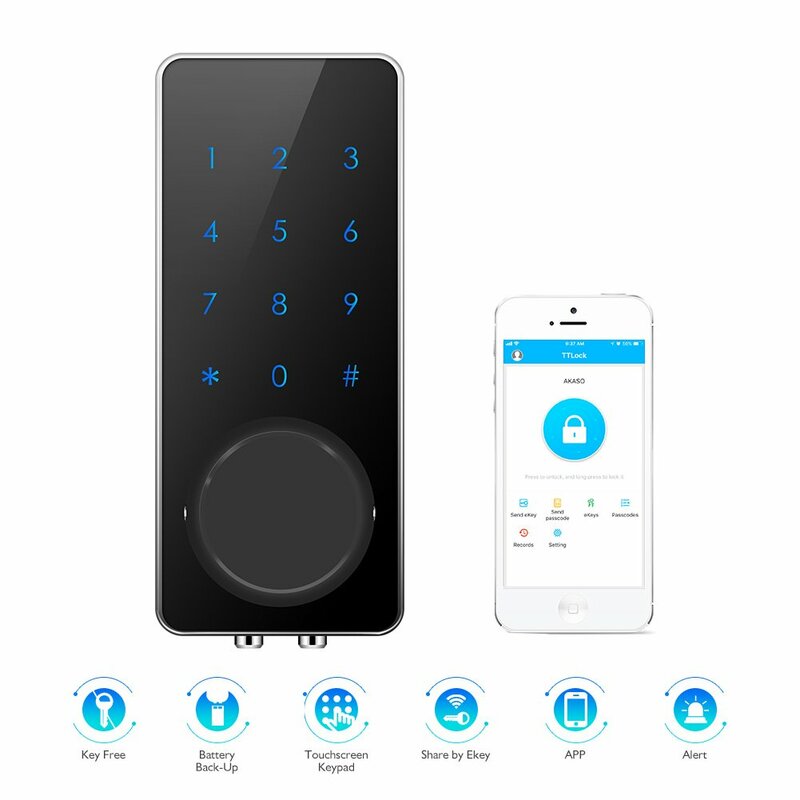 This is an IoT lock and integrates with Z-Wave Plus, ZigBee and iM1 for HomeKit compatibility. This model provides you with a 4-8-digit pin code, and you can create up to 25 individual pins for your family, friends, and employees. If you add the integrator, you can create up to 250 individual codes. The Assure installs quickly, all you need to do is replace the old lock with the Assure, and you are ready to go. This model comes with a weather protection gasket; a one-touch backlit locking screen and a privacy button. The battery cover is tamper-resistant, and the extra slim features make this a preferred solution for many applications, ranging from residential to commercial. The sleek, compact August Smart Lock Pro is a full Bluetooth Low Energy (BLE), WiFi, and GPS “geo-fence” device that protects your home without keys or even codes. This is the ultimate IoT lock that controls your doors from your smartphone. This is an add-on accessory to your current locking solution. All you need to do is set up which phones activate the locks, and you don’t need to do a thing. The moment your phone is out of range, the doors will activate, and the locks will set. When your phone is in range all the doors will be unlocked, unless you program, them to lock from your phone. What is unique is that you don’t need to change the exterior hardware. You install the interior device over the lock mechanism from the inside, and presto you home door locks are now IoT. This means that you can still use your keys if you want, and just to be sure, make certain you buy a bump-free lock, so your home is properly secured at all times. The proprietary DoorSense™ and Auto-Lock technologies let you know when doors are opened and closed. You can also add any number of phones to activate the system, so all family members and any close friends will have easy access to your home at all times. 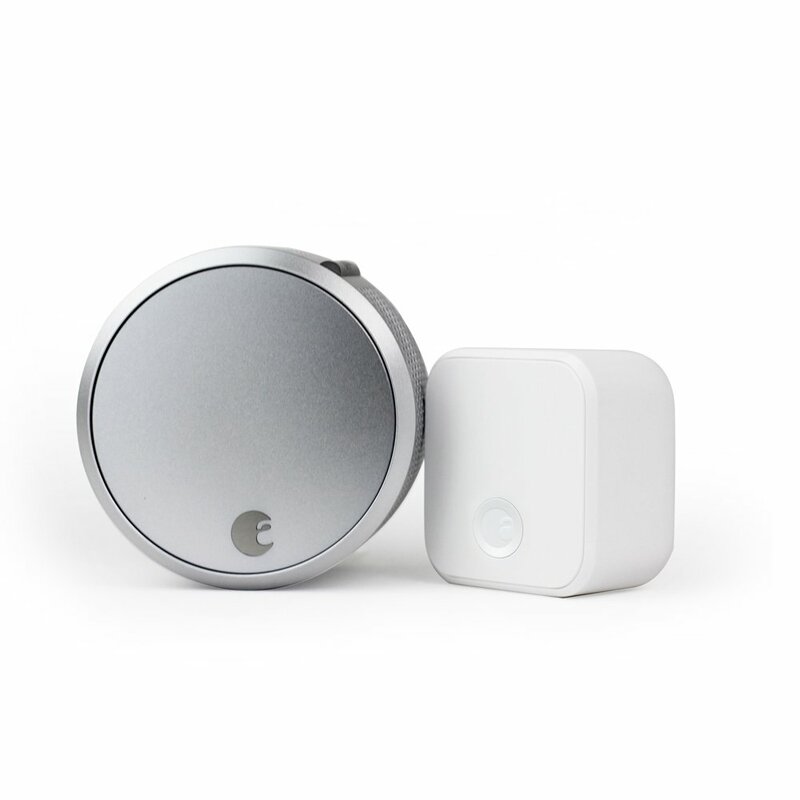 Since this is an IoT locking system, it uses Siri, Alexa or Google Assistant, and you can just tell them to lock or unlock your home, which is a perfect solution for small business owners that use Airbnb type operations. You can add the new guest’s phone to activate the system, and then remove them from the list after they leave. The MiLocks MIEQ-BNSNHB is a hybrid lock that combines IoT, mechanical coding and bump proof key activation in one device. This model comes with a Smart Hub that you control via WIFI over your smartphone, and can add many users with one admin. This acts as a geo-fence, and also allows you to control all doors remotely. Every time your door is activated in any method, the system will alert you, so you will know who and when the door was activated by. This is a three-mode lock, keyless with the smartphone, keyless with the coded pad and key activated with the bump proof lock mechanism. This model can be operated manually using a keypad code, or with a key and code. As such, you have multiple options, and this makes the MiLocks a perfect comprehensive solution for all conditions. 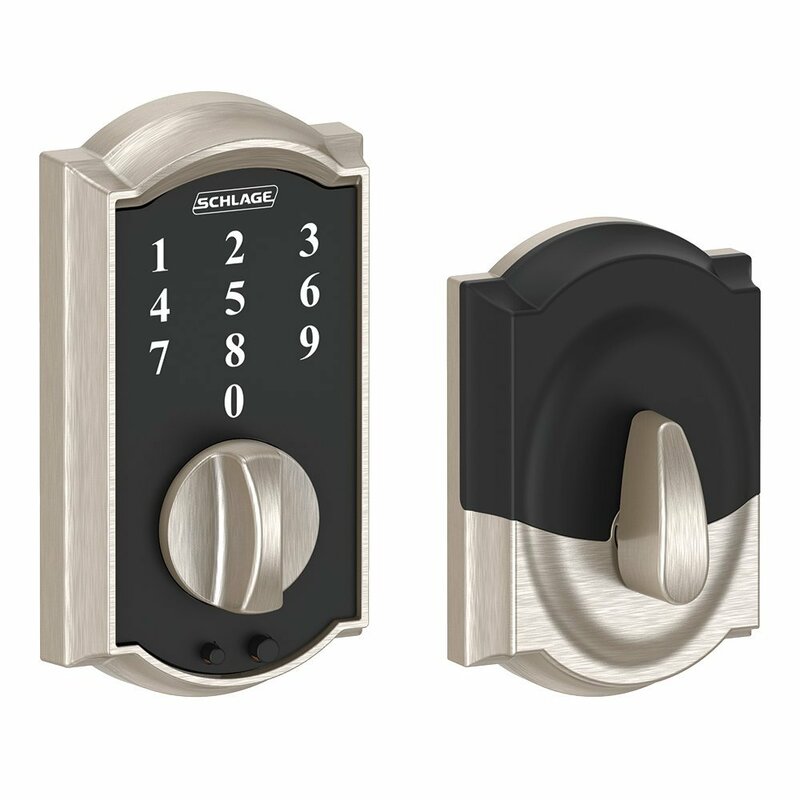 The Lockey 2210JB is a classical keyless locking system that is totally pick and bump proof. This solid design comes with a mechanical keypad and auto-locking feature. This means that every time the door is closed, it is locked automatically, requiring the code to reopen it. If you want, you can press the Y button, and this will place the lock into passage mode, that remains open until you press the C button for auto-locking activation. This is an ADA compliant access mechanism, and the code is 3 to 5 characters. All you do is press the code, turn the knob and open. This is an external and internal model and is weatherproof. It is made of a durable Zinc-plated Steel with interior components made of Teflon coated stainless steel. 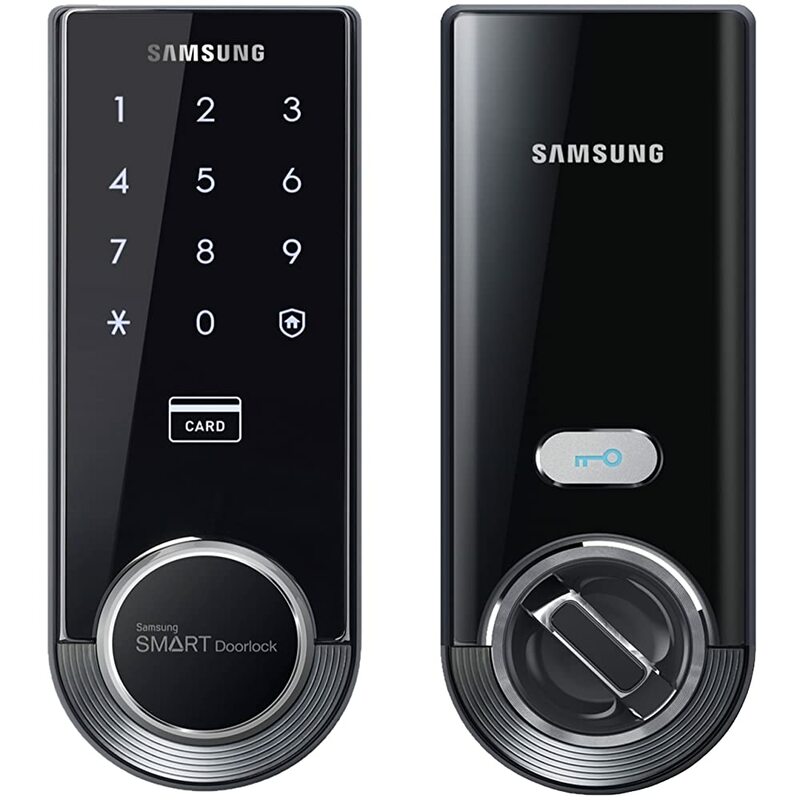 The Samsung SHS-3321 is a comprehensive keyless locking solution that provides coded access; an RFID swipes card access too. This sleek design is for indoor use and is a perfect keyless solution that comes with some attractive features. These features include a built-in fire alarm and a tamper alarm. Anytime someone presses a wrong button the system, will send out an alarm, and when there is a fire, the system, will also send out the alarm. This model is easy to install overall standard doors, and you can program a 4 to 12-digit code and adjust the volume of the alarm to 3 preset DB levels. This smart lock creates a Random Security Code which sets off 2 random numbers; you press these before adding your PIN. This is perfect for putting off would be intruders. To operate this lock, you need double action RFID and passcode, and the double locking feature prevents the door from being unlocked even from the outside. The alarm will sound when 5 failed attempts are made on the lock, and the alarm will sound when the door is forced open. This device comes with a battery panel that can be activated with a 9v battery when the power is out, and there is a low battery warning indicator. The AKASO smart lock is an IoT device that connects to your smartphone and enables you to control access at all times as well as from remote locations. This device comes with password activated and emergency control functions. It is easily installed overall standard door lock locations and is used in a wide range of indoor applications. This model comes with full real-time monitoring, and you will be alerted when 5 attempts have been made with an incorrect password is detected. The auto lock feature locks the door at all times, and the system will also activate the alarm when any force (not pressing fingers) is detected on the panel. 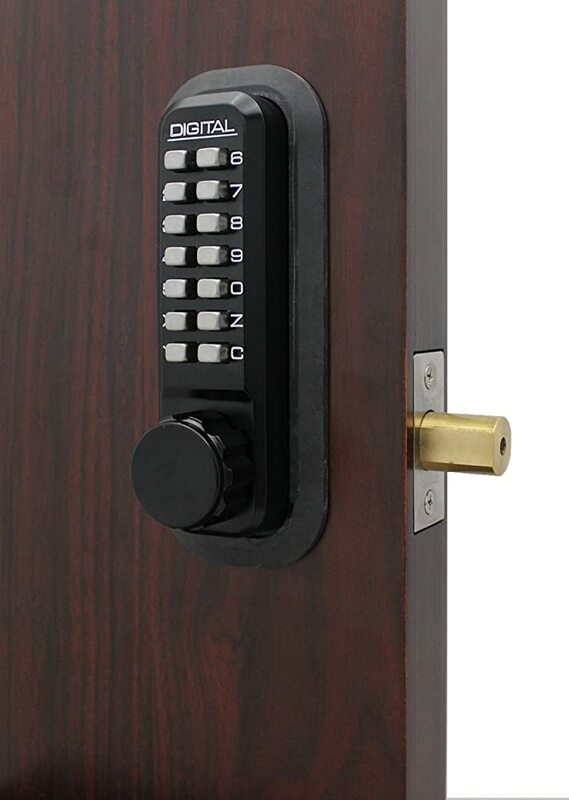 This model comes with a deadbolt button under the switch on the inside, when pressed, this negates any external opening attempts even with a correct password. The Signstek Keyless Digital Electronic (YL-99, also known as Centurion and Turbolock) lock is one of the most basic locks in the keyless bump proof lock models. This is very easy to install and use a system that provides you with one master passcode, and up to nine passcodes. You can edit all passcodes whenever you want, and there is one key mode, where you just press one button and the lock will open. This model comes with a backlit pad built into the handle. 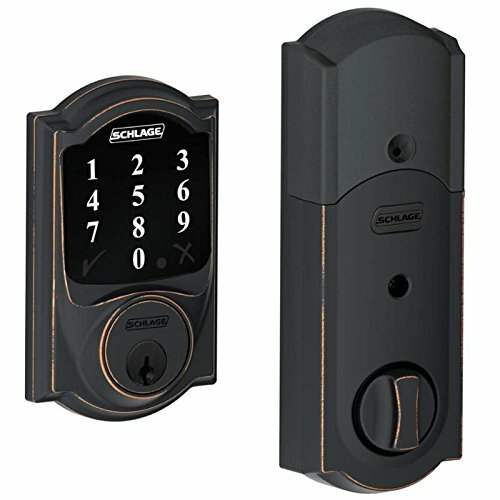 The Schlage Connect model BER568 is a Z-Lock compatible device that provides three levels of security. 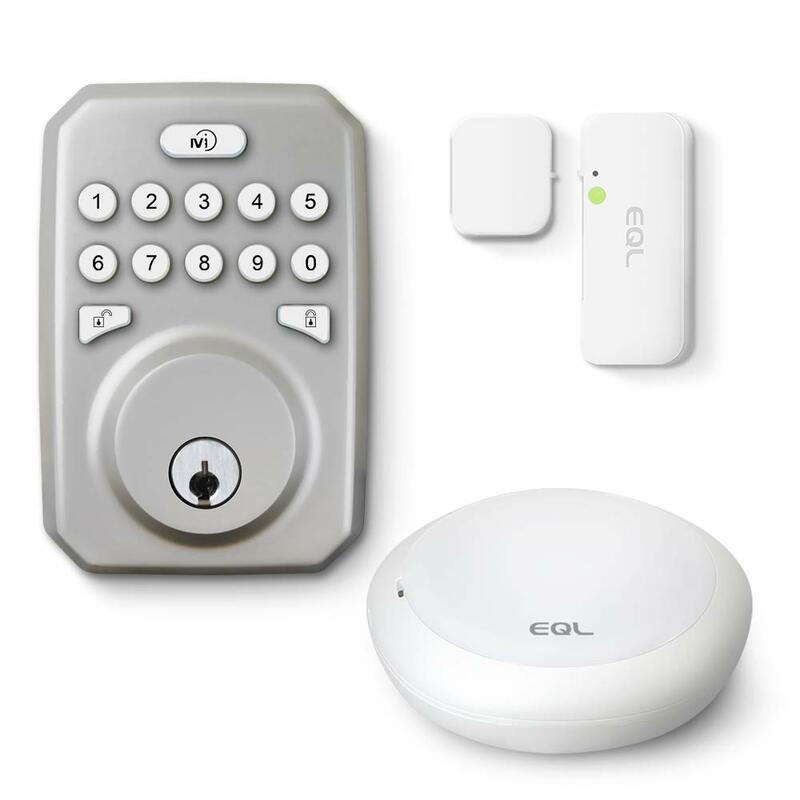 These include a bump proof manual lock, a code pad for up to 30 individual codes and an IoT link through Z-Wave technology that links your lock to your smartphone. This lock has built-in sensors that will activate and sound an audible alarm warning when the door is forced, or the lock is being tampered with. This is a Grade 1 security device, and it comes in a number of finishes and designs. As with all advanced systems, this one is easy to install over any door lock location. Don’t think that by installing the most expensive and most attractive IoT lock you are protecting your home from lock picking. Bump proof locks are basically mechanical designs added to conventional locks. As such, when you buy a smart lock, consider that your system can be “bumped” by hackers. As such, you need to secure your smart lock (IoT) with encryption and cybersecurity. You are replacing one bump proof system with another. Residential homes: A bump proof mechanical lock with key and keypad is enough for maximizing security. For extra security consider adding a solo smart lock (IoT) on specific locations, and choose an option that comes with ample hack-proof security. Commercial Use: when there are many employees, invest in a tracking system, a Smart lock that can give you a special code or RFID card access to individuals, that way you can track everyone. Outdoor Motion Detector – Buyers Guide!